Hydrair is one of the world’s leading manufacturers of ink pumping equipment and associated control systems. In the UK, Hydrair’s home market, Hydrair have provided the ink supply system to almost all major newspaper presses. Hydrair have nearly sixty years experience in this sector and installed their first multicolour ink feeding system for a high speed commercial press in 1969. Hydrair ink transfer systems are designed to increase efficiency, reduce costs and waste and ensure high performance for printers worldwide. 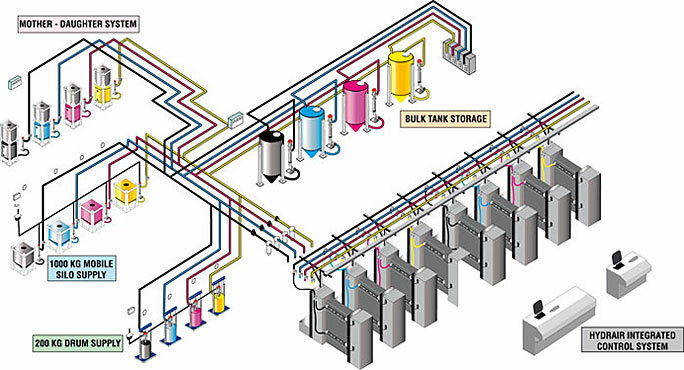 Hydrair provide a unique package of ink storage, pumping, supply and monitoring equipment. The total package consists of advanced mechanical and electronic / electrical products designed, developed, manufactured, installed and serviced by Hydrair.